Who cleans up after CSI leaves a crime scene??? Aftermath is a national company which prides itself on giving guarantees of 100% spotlessness after a bio-hazard or chemical spill, a violent death, or any number of ways bacteria from living organisms can be spread. Their job is to mitigate hazards, to disinfect and make the area inhabitable again. 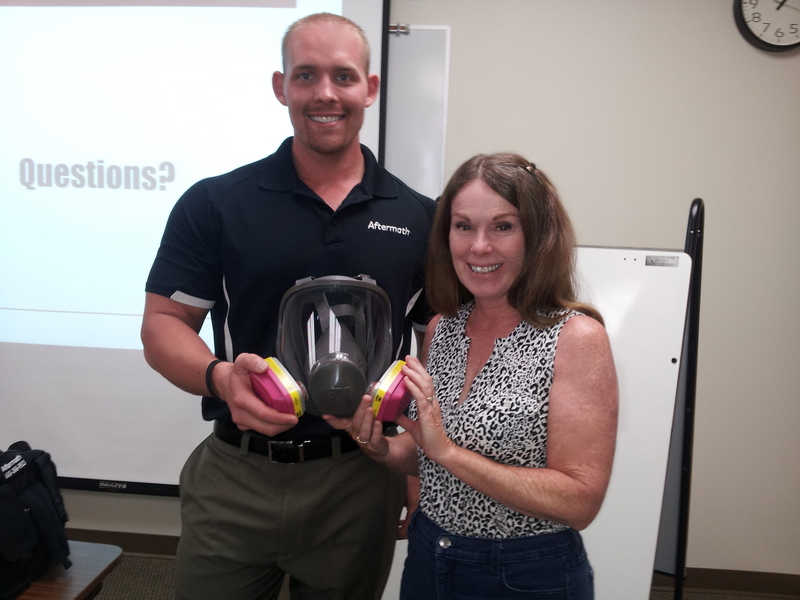 That’s a respirator we’re holding. Andrew W., Field Technician Supervisor, for Aftermath recently entertained a group of twenty plus mystery authors. He told spellbinding stories of real-life, horrific scenes of tragedy which became his responsibility to clean during his sixteen years in the business. He used images from “Carrie,” “Friday the 13th,” and other graphically violent movies as examples of how Hollywood sometimes got it right and, other times, got it wrong. In attendance were members of Sisters in Crime and other authors from several mystery genres: police procedural, suspense, cozy, pschological thriller, all of which may include a murder and its aftermath. Since writers must describe scenes for their novels in detail and without technical error, the information given by Aftermath’s representative was valuable. Ghastly scenarios kept the authors asking questions well beyond Andrew’s allotted time. Q: What was your most memorable case? A: In a small town, a good, happy-go-lucky sixteen-year-old kid from a stable family, committed suicide in his bedroom with a shotgun. He was found by his twelve-year old sister. The scene was so violent, clean-up took weeks. During that time, Andrew talked to the girl when her parents couldn’t. Two hundred friends and neighbors came by with sympathy and food and the family took the cleaning crew in as if they were family. In the end, the girl hugged him and the parents thanked him for allowing them to get on with their lives by cleaning the boy’s room for them and giving them back their home. Q: The work must take an emotional toll on employees. A: It takes a certain individual to do the work, so Aftermath gives psychological tests before hiring and provides counseling whenever an employee needs it. Those who succeed in the job have an interest in forensics and see it as career experience. Q: How long does the average field technician last? A: Six to eight months. Q: How have you managed to stay with the work for so long? A: It sounds odd, but you have to be able to laugh. We use dark humor sometimes to take our minds off what we’ve seen. If anyone can’t shake the negative and dwells in the negative, they become the negative. I look at the positive side and think of getting the families back to some sort of normal after their tragedy. Believe it or not, that’s how mystery writers entertain themselves! I found it enlightening, but will stick to softer, less graphic and violent mysteries. As the man said, if you dwell in the negative, you become the negative. So, my next novel is almost a cozy… The Tennis Team Mysteries.